We were contacted by the construction company Aspec who were building an apartment complex in Freemans Bay, Auckland. They had a client who was interested in making his home as smart as possible. We contacted the owner to discuss his exact needs and requirements. He went on to explain that they live in Wellington full time and this will be a weekend and holiday apartment used for business and personal trips up to Auckland. One important aspect of the brief was being able to have the apartment ready for their arrival, with lights and heat switched on remotely. Their budget was 75K. Fully Automated Lighting – With one-button welcome and goodbye, there’s no need to go around and switch everything on/off individually. Entering your code at the door does everything for you. On top of that, all lights can be controlled remotely, whether you’re home or not. There’s no need to get up from the sofa to dim the lights, you can create mood lighting while watching TV from your phone. Timing allows the lights to come on at a certain time, slowly getting brighter in the morning as you rise, or replacing the setting sun without you even realising it! Aircon integration – Having the aircon remotely controlled allows the owners to set the temperature to whatever they desire. 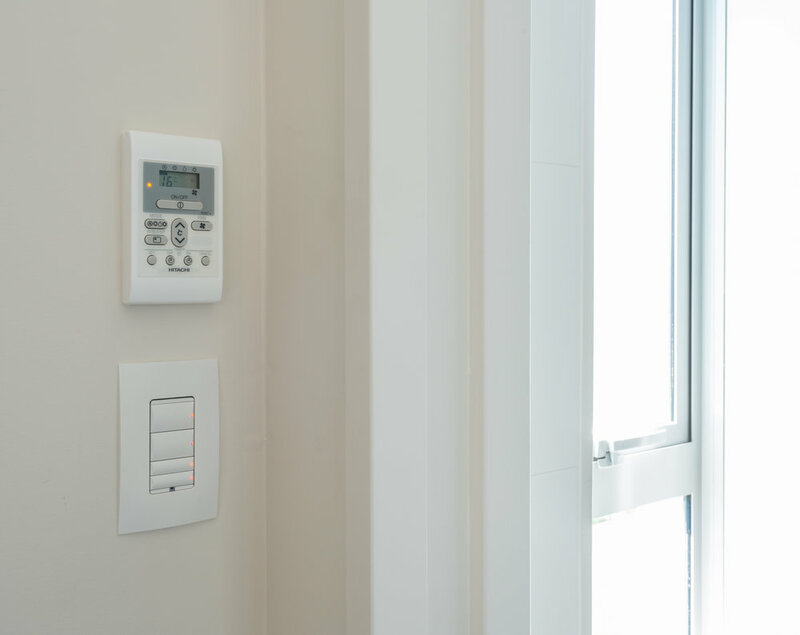 A fully-integrated Aircon system also shuts off when the door is locked and the alarm set when they leave. 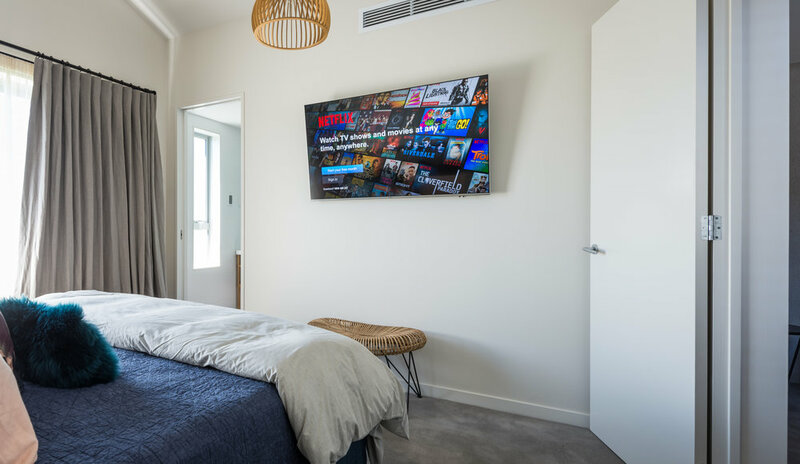 Access and Security – The apartment has a fully integrated alarm system, with high-definition video intercoms, allowing the owners to see who’s knocking on the door. The front door itself has an electronic locking mechanism, which is connected to the system. This allows the apartment to be armed or disarmed remotely at any time. Because everything is joined together, the owners can see the live video feed on their phones and speak to whomever is there via the intercom. If it’s a friend or family member who has locked themselves out, a simple press of a button will open the door for them. Multi room Audio and Video - In this apartment, the living room had a wall mounted 65-inch TV, with full in-wall 5.1 surround sound speaker system. The second living room and bedroom also had respective televisions and surround sound systems, with audio zones in the kitchen, dining room, and deck. All of these systems were connected to the house (and therefore to each other), allowing for full audio and visual integration. This means the owners can watch anything on TV, and seamlessly move into another room and keep watching. The audio zones in the house also allow music streaming throughout. Listening to a favourite Spotify playlist in the kitchen for example, means you can walk into the bedroom and the music will follow. The entire automated apartment is controlled by one system – Control4. 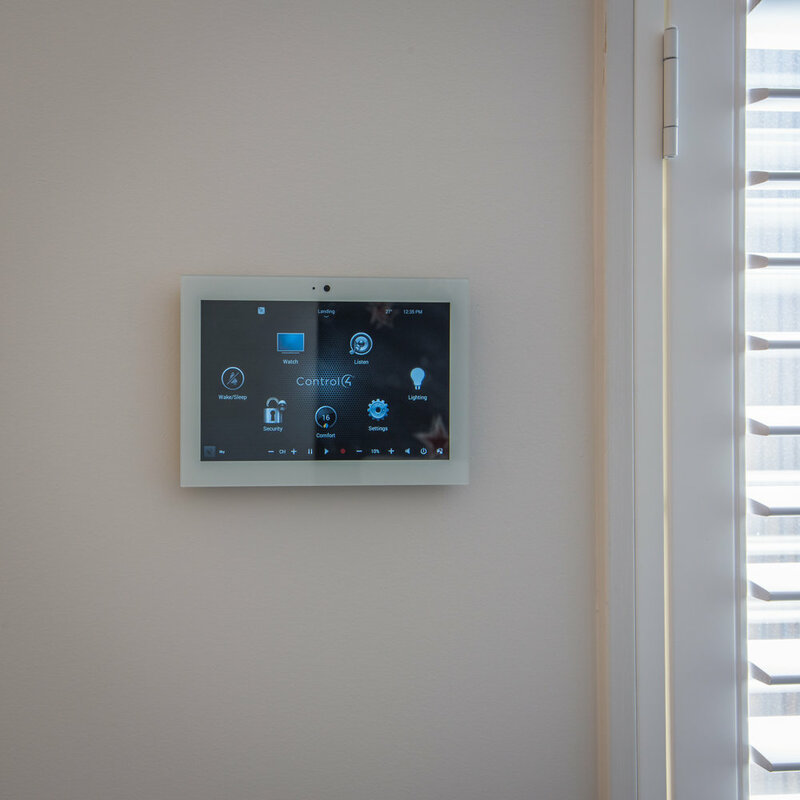 With the Control4 integrated system, the client has complete and seamless control over the entire apartment, no matter where they are in the country, or even the world. The client was ecstatic with how the apartment turned out. From lighting and heating, to security and entertainment, everything exceeded their expectations.